Announced during the introduction of the Apple Watch Series 4, Apple's long-promised ECG has finally arrived with the watchOS 5.1.2 update. We tried out the new electrocardiogram after updating our 44mm model. This ECG, which is most similar to a single-lead traditional electrocardiogram, can indicate signs of atrial fibrillation or sinus rhythm. Once it runs, it will save the waveform, classification, and any other noted symptoms within the Health app on your iPhone to easily share as a PDF to your doctor. Before you are able to take an ECG, you must first set it up by opening the Health app on your iPhone. There you follow a series of prompts walking you through the basics, and limitations, of the ECG app. If you are under 22, based on the birth date you enter, you won't be able to use the ECG or AFib monitoring features. Once set up, to take the ECG, simply open the app, place your finger on the Digital Crown, and the test will automatically start. Using electrodes built into the back of the watch and in the Digital Crown, the ECG is able to read your heart's electrical signals. Every time your heart beats, it sends an electrical impulse through your body and by completing the circuit between your heart and both arms with the Apple Watch in the middle, Apple Watch can create a real-time waveform. It only takes 30 seconds to run the test. When the test finishes, you can add additional symptoms such as dizziness or fainting which will be tied to the test. Apple Watch doesn't show much info, so it will be sent to your iPhone and show up in Notification Center where you can view the results, or export them. 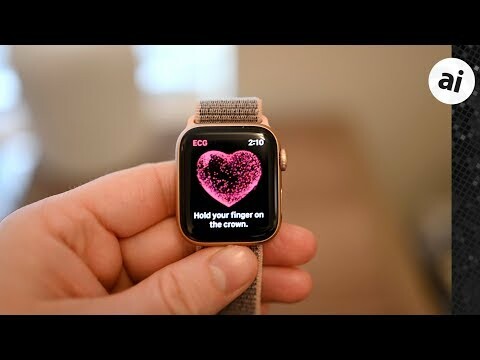 Relating to the ECG, Apple Watch will now monitor your heart rate in the background for signs of AFib, similar to how it already monitors for high and low heart rates. This too is recorded within the Health app under Heart. These medical conditions are serious and often go undiagnosed. According to the CDC, AFib can affect up to two percent of those under 65 and nine percent of those above, here in the US. Apple Watch famously received its De Novo FDA classification clearance less than 24 hours ahead of the big reveal, causing much stress for those at the iPhone maker. I just did my first ECG after reading many notices that the watch is not able to detect heart attacks. I understand that. I see the watch as an unobtrusive way to monitor my heart while I am occupied with other things. I have no heart illness history but it can’t hurt. Yes I am Jewish. Just installed and ran it as well. Pretty neat. I'm good so far. FYI, if you’re on the public beta you need to delete the profile and re-download 12.1.1 to get this to work. I’m just curious why it won’t measure for people under 22 years old? As I also paid the full price for my AW4, I also want to have this very useful health function. So Apple please open it up for customers outside USA. That’s regulatory issues in other countries. You can be sure that Apple wants to have this working everywhere. I was amused to see I could scroll my birth year back well into the 1800s, although they were grayed out and it snapped back to something like 1888. Edit: would love to have a doctor tell me I'm right or completely out to lunch! You can call your doctor while you’re on lunch. It will hopefully don’t take ages, but Norway is a tiny country in comparison which will not be prioritised by Apple. Even if people are open for smart solutions here. Regulation might be likewise difficult as in outher countries like Germany. ...either way, we as customers can just wait and ask persistently. Please tell is what your doctor said afterwards. I don’t think it a matter of being prioritized. Apple has to just put a request in. It’s not a major thing. Many countries even allow what the FDA has allowed to be allowed there too. We’ll see. The reason it's not intended for use by someone younger than 21 is due to the FDA. The FDA considers someone up to 21 years old an adolescent. Apple has to put that on there for FDA clearance/approval reasons. I do have a-fib. I found out just recently (my Apple Watch caught an abnormally high heart rate), and will be undergoing a procedure called atrial ablation very soon now. I just tested the Apple Watch approach. The first reading I got did not show a-fib (sinus rhythm). The second reading, I made sure not to touch my left hand with my right and only touch the crown. It caught the a-fib. Tried it again, purposefully touching my other hand. Sinus rhythm. One more time, being careful not to touch my other hand. A-fib. Anyone know or test how it is deciding if your AW should enable ECG based on The ‘United States’ limitiation? furthermore if its geolocation, is it when download or when install? If you were “in the country” when you bought it then it will work. Otherwise you’re out of luck. It’s based on the country it was sold in. Not region settings or iTunes account settings. Doesn’t seem to be any way around it. I am waiting for Apple Watch to detect my sugar levels one day without any third party devices. The part that caught my attention is: 'Download to a PDF"
This needs to be expanded out into other areas of the Health App (as well as the Activity App) which is otherwise essentially a black hole. Currently you can look at little, tiny, meaningless graphs on your iPhone -- but that's it. The health care industry is rapidly becoming aware of the limitations of taking blood pressure once a year in your doctor's office and migrating over to ongoing monitoring under normal circumstances. The health app could provide you and your doctor with BP measurements taken over a month, 6 months or a year -- but currently all could do is hand him your phone. A PDF would be far more helpful. Heart Rate data in the Activity app is presented in a tiny little graph with no scale and is essentially worthless. Exporting it out into an Apple Numbers chart or PDF graph would enable it to be useful. This export feature needs to be opened up to other functions of the health and activities apps. And yes, Daniel -- you need too get more exercise if a little "running around" gets your heart rate up that high! I did three yesterday and all clear! Amazing tech, looking forward to them adding blood pressure monitoring too if at all possible just with the watch. Just curious what has one's mystical leanings have to do with heart monitoring? Apple was wise to caution people that a the absence of an arrhythmia is not an assurance your heart is healthy. There are a ton of other things that can go wrong with a heart that do not involve an arrhythmia. In fact, the most common type of arrhythmia (A-Fib) mostly impacts brain health more than it does heart health because it tends to generate clots that can then travel to the brain and cause a stroke. That's not to suggest you shouldn't take an arrhythmia seriously -- just that the lack of one is not an assurance your heart is healthy.